Black Ice Software - Document Converter version 1.06 is released! 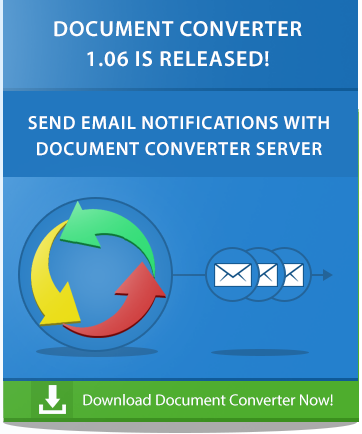 Document Converter version 1.06 is released! New Email Notification feature, faster conversion to TIFF, improved redirect printing and more! Black Ice Software has released the Document Converter version 1.06. This version includes a new Email Notification feature to send emails if the document conversion has completed, or the Document Converter service has stopped. The new Email Notification feature can send emails to the specified recipients about conversion errors, when the conversion finished successfully or to alert users and administrators to review the conversion results during the conversion process. The new Document Converter also includes significant improvements in performance for printing multipage documents to TIFF file formats. A 70,000 page document now converts to TIFF in only 7 hours. Previous version used to take over 48 hours to convert, while the output quality remains the same! A 6000 page PDF file is converted to TIFF in 30 minutes, previous version used to take over 1 hour and 45 minutes. The printing speed improvement does not affect printing single page documents to TIFF file formats. Download the Latest Document Converter!